We’re hard at work producing brand new Resolve V15 training, due to be out by the end of August 2018. If you purchase Resolve V14 Fundmentals now, you’ll automatically get a free upgrade to the new training material when it’s released! 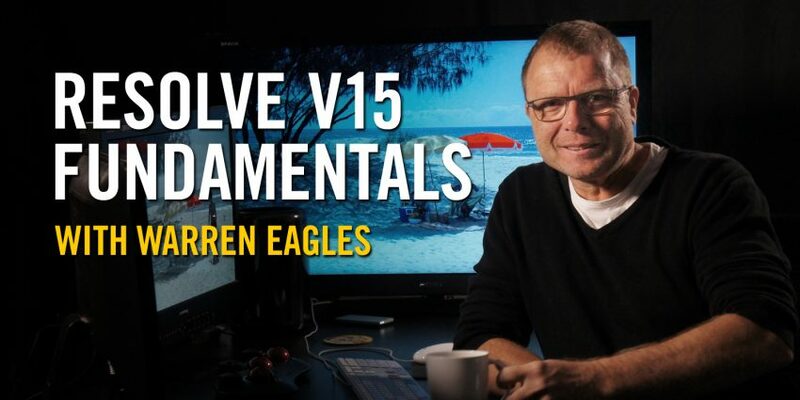 Resolve v14 Fundamentals will show you how to use the new DaVinci Resolve v14 color correction and grading software from Blackmagic Design. 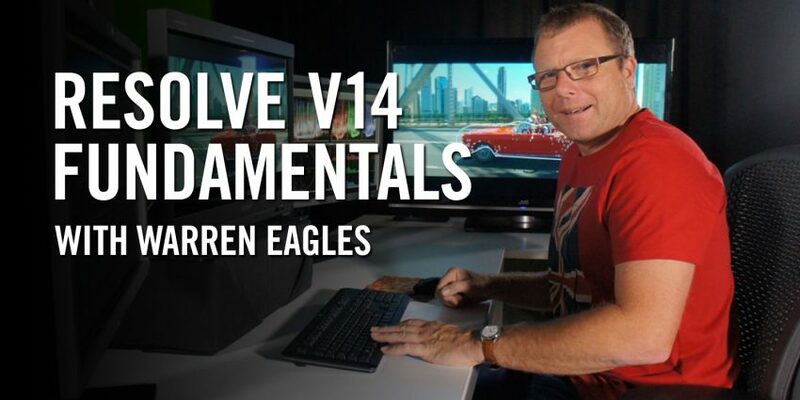 Taught by Warren Eagles, this all-new course contains 12 classes covering the fundamentals you need to know to get most out of this new release. This course is ideal for people new to color correction, photographers, editors, DITs, DPs, VFX artists and directors. Warren always tries to show you why you do something not just how to do them. One of the fantastic benefits of this course is that it comes with almost 6GB of high resolution source material so you can follow the same techniques on the same footage Warren uses. You get the media the XMLs, the reference movies and even the Powergrade looks. This material may be used for learning as well as grading shots for your showreel (commercial use of the footage is not allowed). CLASS 01: Resolve 14, what’s it all about? Sit back and relax, you don’t have to do anything in this lesson. 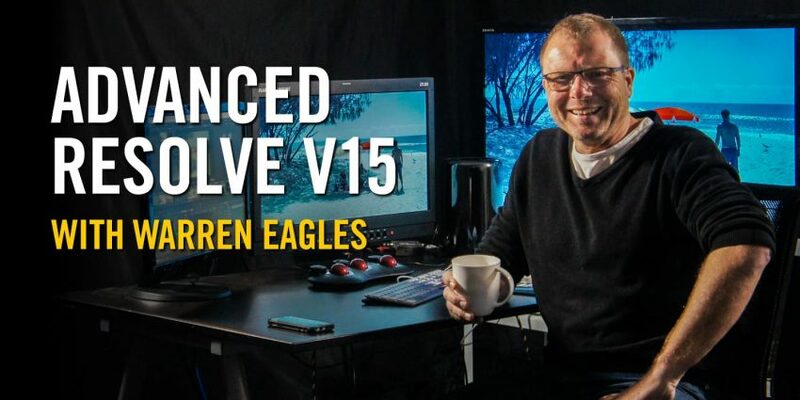 Learn about Warren as he walks you through Resolve v14, examining some of the exciting new features while talking about his career in the industry. See how grading in Resolve can further your coloring options. 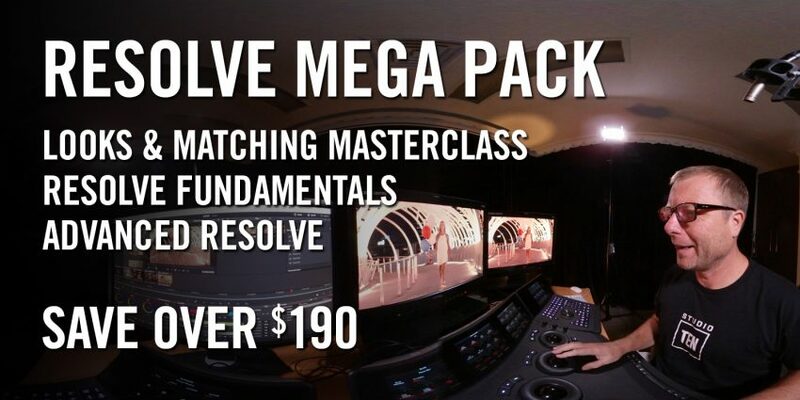 It’s not that hard to learn Resolve and you’ll soon be up and running. Warren starts out with a quick start guide to get you running and works through installing and setting up all of the Resolve preferences. Also, a look at the clone tool. Warren helps get you comfortable with the UI and workflow, examining the media browser, media pool, and how to get media into Resolve. You’ll set up your first timeline and learn which settings are the most important that you need to know. Also, a look at Media Management and transcoding to other formats for better performance in the app?. You’ve mastered getting media in, but how do you bring a sequence from offline into Resolve? In this class, Warren looks at Premiere Pro to Resolve workflow, including how to simplify your sequence for import, how to bring it into Resolve using XML, and the pitfalls of the process you need to know to get the job done right. You’ll also learn how to compare the imported sequence with the offline reference movie to make sure you’re grading the right frames. Warren also covers how to take a “baked sequence” with no edit points and add splices using an EDL or Resolve’s scene detector. If you can grade still images you can grade moving pictures, you just have to remember to hit play. Warren walks you through the process of grading, covering first balancing the picture and then covering primary controls, scopes, LOG versus REC709, offset, contrast and pivot, and saturation tools. Grading bootcamp continues, covering using the grey scale ramp, power bins, colour matching to a colour chart, copying grads, and using the gallery still store to match grades on scenes. Warren’s coverage of primary correction concludes with discussion of bypass all, shot match to this clip, using a split screen to match shots, offset, the vectorscope, lum mix, and custom curves. Why we use secondaries, what they are, and how they make your picture look better. In covering this important aspect of grading, Warren checks out secondary eye dropper qualification, the face refinement OFX plugin, keying faces and skies, secondary hue curves, and appending nodes to your graph. A grade inside a shape can greatly enhance your product and, really make it stand out. You’ll learn how to add depth with windows and what each of the five power windows does and which one to use for best results. Warren also covers edit, input, output, node, and reference sizing. Warren uses keyframes all the time to subtly change the mood of a scene by slightly changing the color to indicate emotions such as danger or happiness. His go-to tracking tool helps tremendously with this process, quickly and easily locking a shape to a face or car to make the needed adjustments. In this class, he’ll use a project to demonstrate starting out with a preset, editing shots into the timeline manually, reframing a shot to create a digital move, and the benefits of ease-in/ease-out. You’ll also learn how to auto track a face or car as well as animating that shape once it’s tracked. He also covers a Jennifer Aniston look to David Fincher look using keyframes — for those of you that are not regular cinema goers, that is warm and saturated romcom style to dark and desaturated thriller style. Nodes are great, but which one should you use? According to Warren, this is the most asked Resolve question ever, so he demystifies the nodes and covers the differences between serial vs. layer vs. parallel nodes. This class begins in Premiere and shows the workflow of getting your footage into Resolve, grading it before sending back to Premiere for finishing. Warren covers the real-world challenges and what you should look out for in order to make it a seamless process. 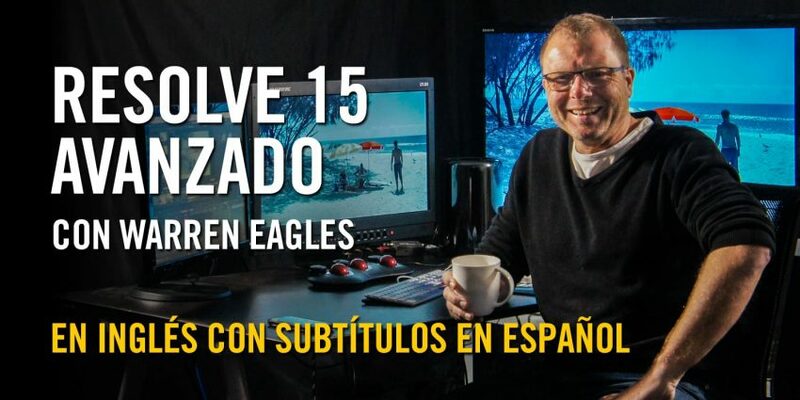 He’ll cover Premiere prep, XML, grading the sequence, render settings, and import back to Premiere Pro.